Using DVD Archive Software WinCatalog 2018, you can easily organize your DVD archive. WinCatalog will automatically scan your DVDs and create a catalog of all DVDs and files. It will automatically grab thumbnails and basic info for video files (including codec, video frame resolution, audio tracks information, etc. ), ISO files, ID3 tags for music files, EXIF tags and thumbnails for image files (photos), contents of archive files, etc. You can organize your DVD archive catalog, using tags (categories), virtual folders and any user defined fields, and specify a physical location of each DVD. WinCatalog also provides an advanced powerful search, including search for duplicates. "Catalogs all my video quickly and correctly, great product!" "The answer to a prayer - at last I can have a full inventory of all my media assets." WinCatalog 2018 is rated 5 out of 5 based on 288 votes. For Windows 10, Windows 8.1, Windows 8, Windows 7, Windows Vista, Windows XP. Free, full-featured 30-day trial version. If you haven’t purchased a licence key - read-only mode after 30 days. Easter Sale - 20% OFF! WinCatalog DVD archive software scans your DVDs, remembers all the folders, files, and some additional information about your files such as ID3 or Exif tags, thumbnails for pictures and video files, contents of the archives and ISO files, parts of text files, tags from saved web pages, thumbnails for PDF files, etc. 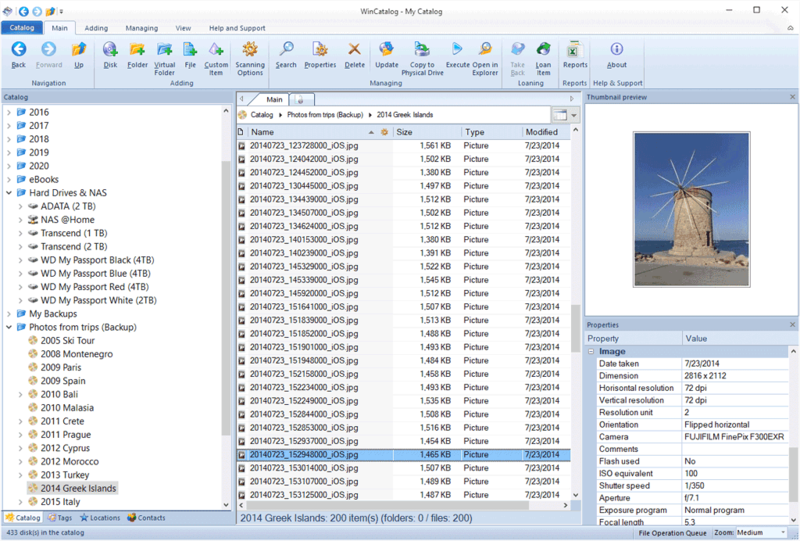 The main goal of WinCatalog DVD Archive Software is to give an ability to browse and search through your catalog even if when a DVD is not inserted to a computer. For example, your files can be located on a removable hard drive, on a shared network folder, or burned on a CD, DVD, or a Blu-ray disc, and you will be able to find files with WinCatalog DVD Archive Software and even preview their properties, including picture thumbnails, before inserting or connecting a DVD or any other disk to a computer. Otherwise (if you do not use WinCatalog), in order to find a file you would need to connect DVDs, CDs or other disks or insert DVDs, CDs one-by-one to find a specific file. In other words, WinCatalog DVD Archive Software saves your time and efforts in finding files on DVDs wherever they are located. Let WinCatalog DVD Archive Software scan your DVDs just once and it will remember all the details! 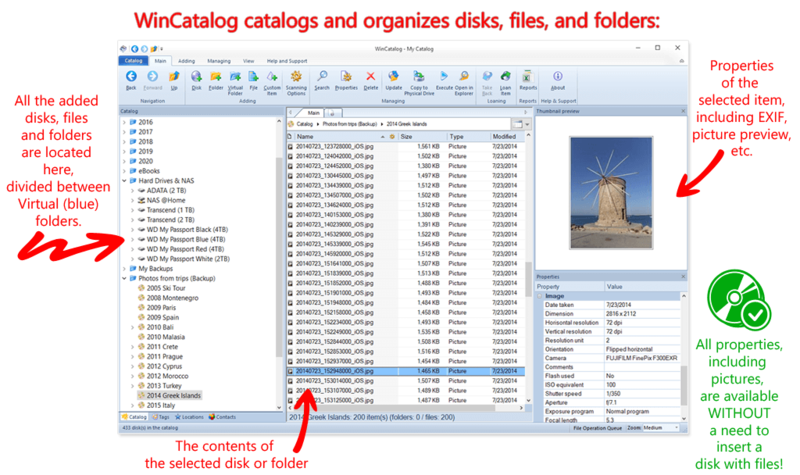 Manage your DVD archive, using categories, virtual folders and user defined fields. Create and assign tags. Browse using the grid or thumbnails view modes. Find necessary files, stored on DVDs, using powerful search with natural search queries, wildcards, or logical search operators.